Yes ladies and gentlemen, you are seeing two posts on one day. I know for my few followers(Hi Mom and Mel Mel!) that this is a rare occasion, but I have several cards that I have made and hope to post them over the next few days. So today I will post another card. This is a thank you card that I created for one of the customers of my first party. All she ordered was a catalog and I needed to get her copies of her receipt, so I thought this card would work perfectly to hold those. My party was her first Stampin' Up party to attend and I think we have her hooked. 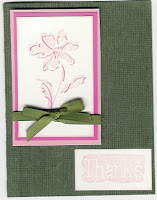 I was so excited to introduce someone new to stamping that it made my day. She is planning on ordering stamps, but is waiting for the World Card Making Day special in October where the Simply Sent kits will be 20% off from Oct 4-8. If you are interested in ordering one of these kits please let me know. I wish they would have offered something like this when I first started. You get a little bit of everything with the paper, ink, and accessories. The 'Thanks' on the front of this card doesn't show up very well in my picture, but it was really pretty in person. 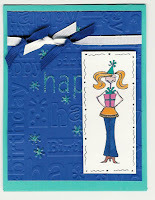 This is my first card to make with the 'Heartfelt Thanks' set and I really like the way it turned out. 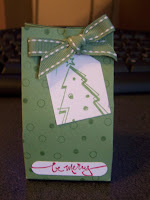 Can you tell that I am enjoying my new Always Artichoke ribbon and stamp pad?? Just think... the week is already half way over and we're on our way towards the weekend! Have a happy Wednesday! Bella with her cute little hat! The card on the left was for Kellie(sister-in-law). I tried glittering parts of the embossed words on the background for a different look. I tend to be very messy with glitter, so one card of glitter was enough for me. On my mother-in-law's card I used my glitter pens to accent Bella's hat and present. Both cards turned out really cute and they both loved them. Hope you enjoy them too! I hope everyone had a great weekend. Chris and I had so much fun in Houston watching the Red Raiders beat Rice and hanging out with all our friends from college. 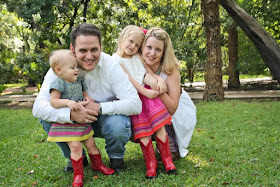 Houston is a great place to visit, but I could do without the humidity! Today is a co-worker's birthday so I stamped her a card last night. She is a fellow Red Raider fan, so I thought she would appreciate the red and black. I used my new Cuttlebug 'Happy Birthday' plate that I bought last week. 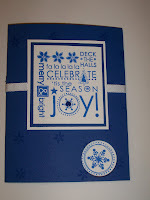 I am still playing around with how to use it, but I love the embossed look and it is so easy to use! 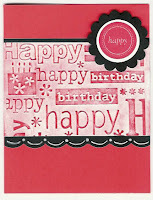 One this one I embossed on white paper and then ran my red ink pad all over the paper for a different look. Of course I had to use my scallop circle punch and those It's All Good stamps fit just perfect on the scallop circle. I added a little doodling to the bottom to give it a softer edge. I hope to have some pictures of our weekend up in the next couple days so be ready for more red and black! I am so excited that it is Friday! Work has been really busy as we are closing our fiscal year and I have barely had time to touch my stamps. Yesterday was my niece's sixth birthday and I made this card over the weekend for her. The candles stamp was only 5 candles, so I stamped it again and then cut them out to put on the cake. Before attaching to the cake I covered them in pink glitter. I also went over some of the polka dots in a glitter gel pen. On the inside it says 'Birthday' in pink glitter. I know how much my niece loves pink sparkly things so I thought this would be perfect for her. I hope she had a wonderful day yesterday! I told Mel that I was going to be better about posting everyday, but this weekend I am going to be gone. Chris and I are going down to Houston after work today to visit some of our friends from college and go to the Texas Tech vs Rice game tomorrow. I am so excited since Tech is now 2-0. Go Red Raiders!!! I am also very excited to see our friends from college. I plan on doing some stamping when we get back Sunday because I have lots of September birthdays that I have not made cards for yet! Have a very happy Friday and a great weekend! My sister-in-law had me make one of her girlfriends a set of my martini coasters and needed a card to go with them. You can check out my coasters and other creations at my website. I threw this card together Friday night, but love the way it turned out. The bellas are just so much fun to color and if you haven't heard about them, go over to Stamping Bella right now and check them out. I just love all the different personalities that she has in the Bellas. Well I promised Mel that I would finally post some stuff that has been going on lately. She gets onto me when I haven't posted in a few days and I think it's been over a week since I last posted. Saturday was my first SU! party and it was so much fun. Thank you Beth Ann for being the brave one and letting me try out on her party. Everything went great and we had so much fun. The ladies who came were so much fun and they made me feel so comfortable as I made two different cards and one non-card item. I have another party in little over a week and plan on doing the same things for them since these were such a hit. Plus the kitty from Haunting Halloween is precious and on sale this month as part of the Fall Frenzy sale that SU! has going on. 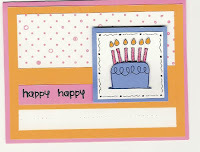 This my first card that I did and also the make 'n take for the party. In case you aren't familiar with SU!, this would be the card that you get a chance to make yourself and take home. I can't take complete credit for this card because I started with someone else's idea off of Splitcoaststampers and added my own touches. 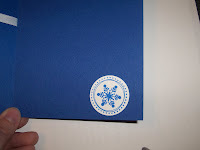 I included a second picture so that you could see the way I punched a hole in the front of the card for the snowflake to show through. My second card was a non-typical card size. I cut this card to 5 1/2" x 6" and scored it on the 3". I think this kitty is so cute and I love how this whole set works together and doesn't need any other sets to complete a card. I stamped the inside of this card with the 'a Haunting Halloween' saying to finish it out. 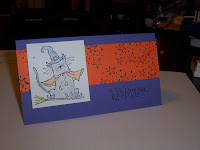 This was my first creation, but for the party I mounted the kitty on black before adding it to the card. I wanted my final creation to be something non-stamped and I wanted to use one of the new In-Colors from SU! So after much deliberation and one creation that lacked some pizazz, I decided to do a 2-4-6-8 box. If anyone else is like me, I have 13 ladies in my group at work and that gets pretty expensive at Christmas time. I love little treasures like this that you can fill with chocolate. Everyone in my group appreciates having a little bit of chocolate on hand when it gets stressful and this is just the perfect size. I also couldn't resist using the new double stitched ribbon. I tried my hardest to use the scallop circle punch somewhere on these three items, but couldn't figure out where. The tag is not actually attached to ribbon, but adhered directly to the box to make it look like that. Just in case you were curious, the box is about 3 1/2" tall and 2" wide. If you want to make your own boxes you can find the instructions here. The Fall Frenzy Promotion runs from September 1 through September 30. Spend $30 in regular priced merchandise and qualify to purchase one of each of the six promotional stamp sets listed below at 30% off! The World Card Making Day Promotion runs for ONLY 4 DAYS from October 4 through October 8. World Card Making Day is the 1st Saturday of October (which is on October 06th this year). 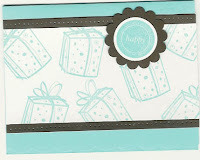 To celebrate, Stampin’ Up is offering 20% off of ALL of their Simply Stampin’ Card Kits (See pages 12-14 in the Fall-Winter 2007 Catalog). 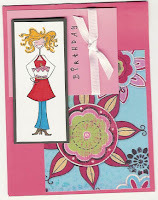 These kits are wonderful for busy stampers. 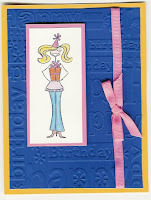 You will get instructions as well all the supplies to make at least 10 cards, including ink, paper, embellishments and even envelopes.